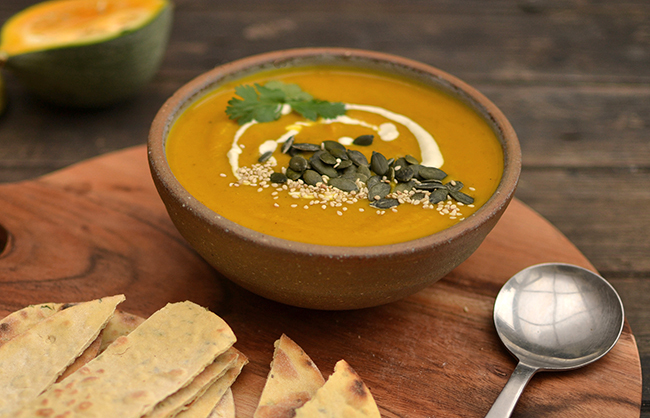 This is a fiery yet sweet soup that’s perfect for cold autumn days. Smooth and satisfying and of course packed with immune boosting spices to protect you from winter illness. Containing the Queen of The Spices – Turmeric – known for its powerful antioxidant qualities and topped with vegan cashew nut cream. Truly nourishing. 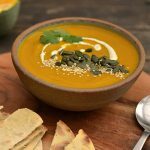 This is a fiery yet sweet soup and its perfect for cold autumn days. Smooth and satisfying and of course packed with immune boosting spices to protect you from winter illness. Containing the Queen of The Spices – Turmeric – known for its powerful antioxidant qualities and topped with vegan cashew nut cream. Truly nourishing..
Soak the cashews a for approx 6 hours before for cashew cream. Pre-chop all the veg so that everything is ready. Heat coconut oil in large saucepan on a low heat until melted then add the onion. Stir for 5 mins until starting to go transparent. Add the garlic & salt and fry for another few mins. Next add all the powdered spices and keep stirring as blending in with the onion and garlic. Next add all the chopped veg. Give it a quick stir to coat with all the spices then top up the pan with 1.2 litres of boiling water & veg stock. Increase the heat to a medium heat and cook, ideally with a lid on, for 25 mins. In the meantime, to make the cashew cream, drain the cashews and place in a blender with the plant milk, salt, pepper and nutritional yeast, blend until smooth, adding a touch more milk if not desired consistency. Serve with the cashew cream drizzled on top or stirred in as desired. Shop at www.indigo-herbs.co.uk for your Turmeric Powders as well as a broad range of superfoods and herbal ingredients. Indigo Herbs is passionate about supporting you on your journey to natural health and clean eating.